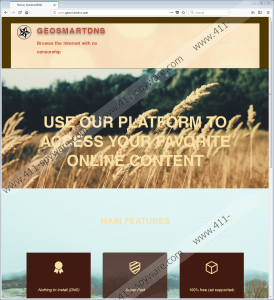 GeoSmartDNS is a program that will allow you to access geo-restricted content. Even though it is a free application, you agree to see commercial advertisements by installing it on your computer. Of course, not all users install it consciously. As a consequence, not all people can explain why they have started seeing irritating commercial advertisements on their screens. If it has turned out that you see ads because GeoSmartDNS has been installed on your computer, you should remove it right away. Unfortunately, it does not mean that you will stop the flow of advertisements by doing so. 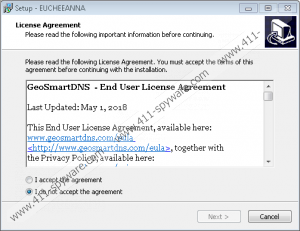 GeoSmartDNS modifies DNS settings upon installation, but it does not undo the changes applied if a user decides to remove it from the system, so the chances are high that you will continue seeing commercials unless you reset DNS settings yourself. Legitimate programs do not act like this, so we suggest that you eliminate GeoSmartDNS from your computer as soon as possible. Continue reading to find out more about it and its removal. Do not install GeoSmartDNS on your computer if you do not want to see commercial advertisements because this program changes DNS settings to 82.163.143.146 and 82.163.142.148 and then starts displaying various commercials. Since GeoSmartDNS collects information about users’ interests and habits, you might find some of these ads quite interesting, but you should still not click on any of them to stay safe. We do not say that all advertisements adware programs provide users with are dangerous, but you might click on an untrustworthy advertisement with a link that opens a dubious website accidentally as well. We cannot promise that these websites do not contain any suspicious applications, so, in our opinion, it would be best not to click on any ads displayed by untrustworthy software. According to researchers at 411-spyware.com, GeoSmartDNS should also actively collect information about users so that it could show targeted advertisements. This adware program will not steal sensitive information from your computer, but it will record some non-personally identifiable details like your browser type, Windows version, IP address, links you click, websites you visit, and much more. You can do nothing to change its operating scheme, but you can delete it from your computer whenever you want to if there is something you do not like about it. We do not think that there are many users who have installed GeoSmartDNS on their computers consciously because it is impossible to download this program from its official website (http://www.geosmartdns.com/). Speaking specifically, the Download button is missing. Since users still encounter GeoSmartDNS, it means that it is distributed in an alternative way. Specialists say that it should be distributed bundled like many other advertising-supported applications. Adware programs travel together with other programs, usually free applications users find useful and decide to download from the web, so they enter computers unnoticed. If you are sure you have nothing to do with the GeoSmartDNS installation but can remember downloading software from the web recently, it is not surprising that you have ended up with this adware program on your computer. Adware programs are not sophisticated malware, so it is not that hard to prevent them from entering the system. You should simply stop downloading software from random websites and start installing applications more attentively. It would be smart to have a security application installed on the system as well to ensure the maximum system’s protection against malicious software. Annoying advertisements coming from GeoSmartDNS can be removed from the screen by deleting the adware program and then resetting DNS settings. It is not a problem if you have never erased any program changing DNS settings before because we are sure you will successfully remove it with the help of our manual removal guide (find it below this article). Alternatively, you can entrust its removal to a reliable antimalware scanner. Type Control Panel in the box and press Enter. Type cmd in the command line and click OK. Type ipconfig /flushdns and tap Enter. Select All Programs and click Accessories. Right-click on the Start menu button.